If a million people that never met can come together online and create an encyclopedia as good or better than Britanica’s, What else can we do? Can technology enable mass collaboration for legislation and government and do away with lobbyists and corrupt politicians? A film by IVO GORMLEY and Banyak Films, distributed by VODO and FrostWire. In his student flat in Colchester, Jack Howe is staring intently into his computer screen. He is picking the team for Ebbsfleet United’s FA Trophy Semi-Final match against Aldershot . Around the world 35,000 other fans are doing the same thing, because together, they own and manage the football club. If distributed networks of people can run complex organisations such as football clubs, what else can they do? The founding principles of these projects — transparency, self-selection, open participation — are coming closer and closer to the mainstream of our social and political lives. Us Now describes this transition and confronts politicians George Osborne and Ed Milliband with the possibilities for participative government as described by Don Tapscott and Clay Shirky amongst others. 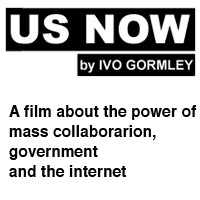 US NOW…a terrifying concept.Terrifying is that they the people using this tool had the intelligence to do it before the regular tax paying Joe.Ive forever maintained if the young generation of late 60s early 70s armed with this same tool would have taken the world in a different direction,largely for the better.That tool is at our disposal…wake up…use it…participate in drowning the Monster.A few with no fiancial backing cant do it for the masses,there is strength in numbers with knowledge and communication. I guess this generation could be even more participative, but the technology has also been used by the pupeteers to distract the young, and worry them about other things (and lies). It's indeed a terrifying concept. I've thought that another way to really excercise true democracy, the tax system could be a great instrument. If you were able to (optionally) decide where say 20% of your tax money goes to on your 1040 (you mark the percentages to different broad budgets, say education, healthcare, infrastructure, international aid, scientific research, social programs), that'd be a great step into excercising democracy every quarter, not every 4 years. What details does the aversge joe convey, to aide global social reform? How varied are the subject matters? Does each subject/issue have its own domicile/forum? Global social reform would never happen if we don't start with ourselves, then the immediate people which surrounds us, and hopefully the whole world. The govts. of today are a fraud – it is time for We the People to rule! THE UNITED STATES is a corporation. Start here – pursuant to 28 USC 3002. Definitions. it's nice to see people getting fired up with these concepts, specially the young people. I'm a almost 50 year old lady that belives that our teenagers of today will make tommorrow a better place. Please do email me this work, [email address] man hit me up, if anyone is open for discussion lets talk. I don't agree with you on the part of us having world wide communication being something bad. If anything having us disconnected was awesome for whoever is behind NWO. If I ran my my own secret NWO society, the first thing I'd hate to loose is the power of controlling people's beliefs via my Media and News outlets. Thanks to the internet we have loads of people documenting what actually happens even before it goes out through the older channels, which we used to believe in blindly until not long ago where all other information wasn't as readily available and so many things were based on rumors. hi.. im dominique,17 years old. I find the thing that you said really intriguing and i'm eager to know more about it. I believe that the youth should be more aware of these things. can you email me that paper…? please? I agree completely with the A merica being a corporation. I have felt like this for many years and have been spreading the wrod where I live about my feelings. Everyone that I have talked to even high ranking members of church and others agree with me once they take a look at the structure and way America is governed. frostwires videos are not freaking working!!!!!!!!!!!!!!!!!!!!!!!!!!!! why not?!?!?!?!? some one olease tell me why!!!!!!!!!!!!!!!!!!!! is it only me that its not freaking workingg for!!!!!!!!!!!!!!!!!!!!!!!!!!!!!!!!!!!! I read article about VODO project on the Torrent Freak. Good luck with the project. It's always nice to watch some qualified dcumentary…and even it's free. Give more specific detailed you have faced here. “videos are not working” means you can not download it or can not play the file you download ? i'm definitely interested in reading your paper. email me. Hey – I'd LOVE to read that paper! i can’t get any of my searches to appear like i clivk search and nothin shows up wtf ? i cant get any of my searches to show up on my frostwire i click search and nothing appears wtf do i do ? You see ! This is why i so rearly even read blogs any more hear they want to unite and use the power of numbers to emprove the rediculous flows our goverment has and yet people are already talking about NWO we need to unite and do exactly what there talking about reconstruct our goverment so we no longer find ourselves in these deficites if we could all unite as a mass and resolve these type of issuse then we might could talk of a globle benificil NWO but for the most part you guys sound like a cult the way your talking of instiantainous NWO and im not trying to ofend but i want to reply to all your blogs as honestly as possible and please reply. I'm not sure however if the masses are wise. There should be some sort of qualification process, some sort of test to rid the opinions of the fools. Even if the masses could vote, there would still be a lot of money from the usual suspects in promoting their ideas to the masses, so things wouldn't change. It's a great idea, but It has to be thought out well, for what I say is also not unfair since you don't want to be elitist and exclude less smart people from decision making. katmanwon … can you please e-mail that paper on the US government? i have some ideas also if you're interested in me forwarding some e-mails to you.